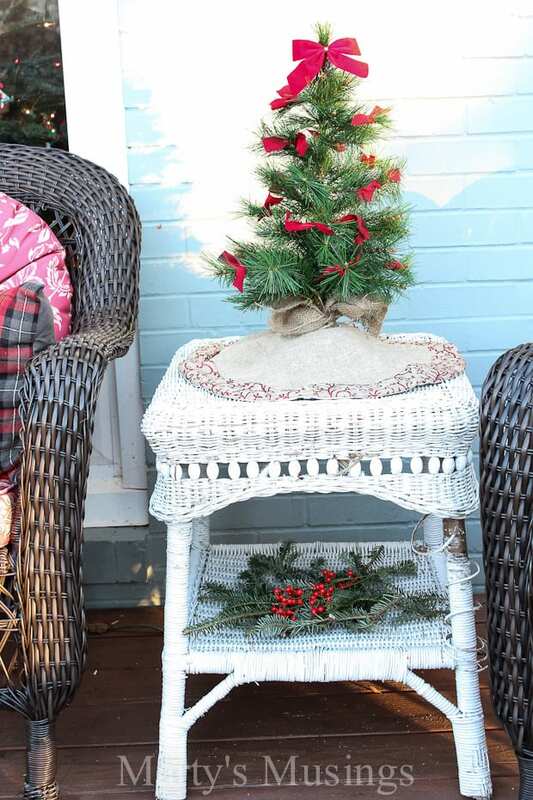 By using natural elements and thrifty yard sale, free and repurposed treasures these deck decorating ideas are inexpensive and perfect for Christmas. 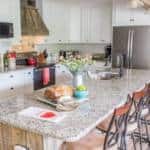 We now love having a front entrance to our home (previously we had a stoop) and an outdoor room that sets the tone for entertaining friends and family in our home. 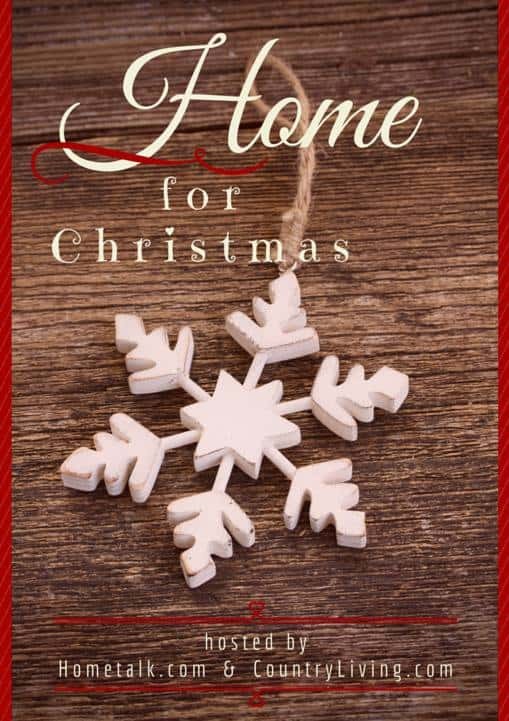 Today I’m excited to be joining with my fellow bloggers from the Hometalk.com community as well as CountryLiving.com as we share fun and inspirational Christmas projects. 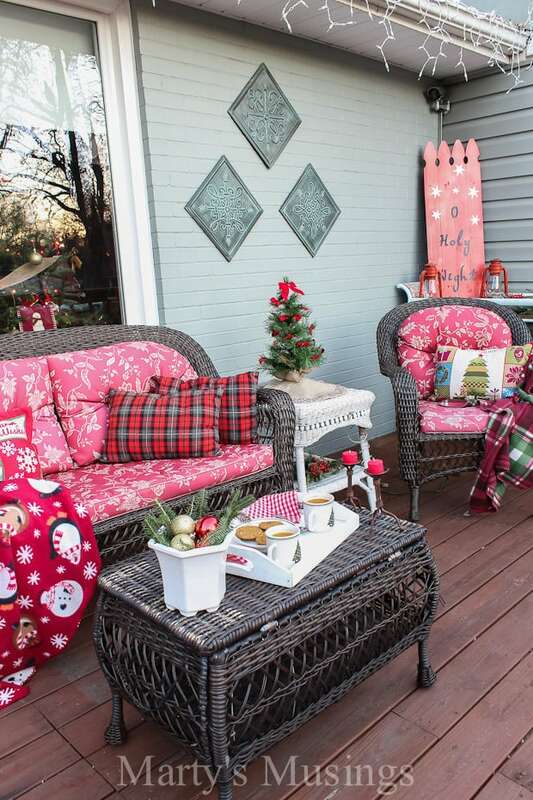 Now I have tons of inexpensive deck decorating ideas for Christmas to share! Almost everything on our deck except the love seat, two chairs and trunk were either bought at yard sales, found on the side of the road or transplanted from my home decor stash. 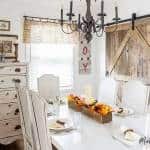 When you choose rustic shabby chic as your decorating style it’s easy to shop yard sales and haul curbside treasures to transform with a little bit of paint and distressing. Or in the case of our deck, let the elements weather them a bit! This year I used a lot of natural elements with evergreens from the Christmas tree lot and red berries from the neighborhood. I also mixed faux with real, like this Christmas tree and the greenery below. 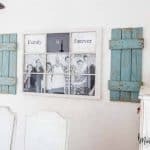 I wanted the deck to have a cozy feel that would entice guests to relax, whether inside or out, and these no sew place mat pillows and an inexpensive throw do just that. 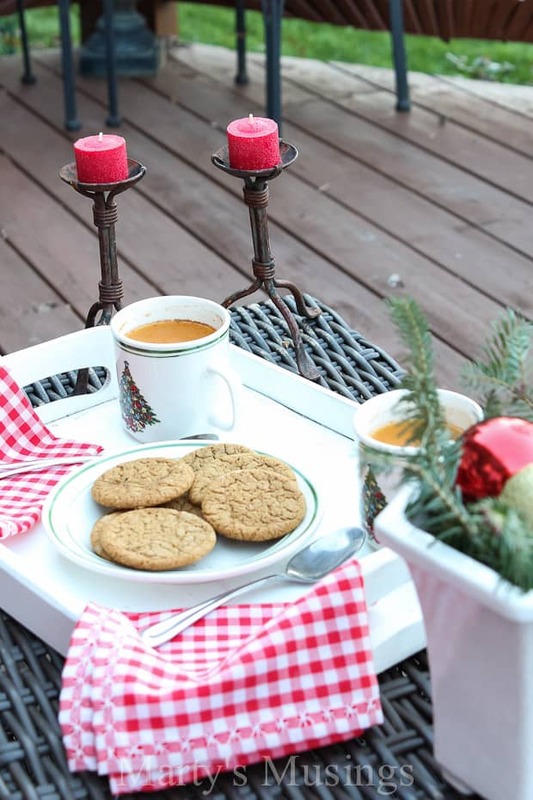 This trunk provides a perfect setting for a plate of homemade Molasses Cookies (and these are addictive!) and my Instant Russian Tea. These candle sticks have been out on the deck for months and are rusted perfection for my simple table. 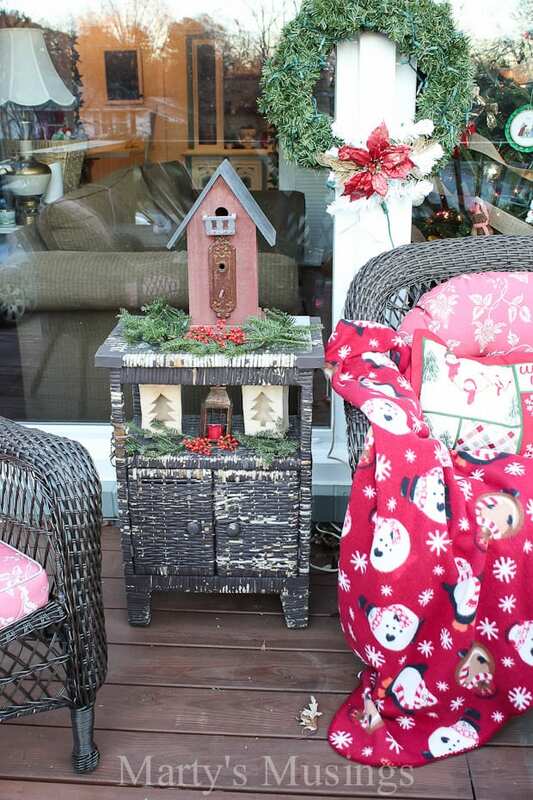 A planter holds a bit of greenery and ornaments. What could be simpler? This changing table (now turned DIY Garden Cart) that I bought at a yard sale for $15 was a perfect place for more deck decorating ideas. 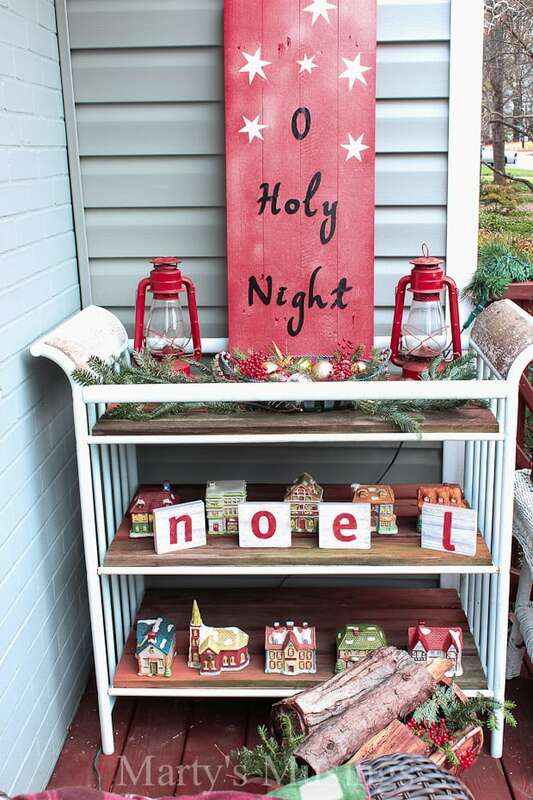 The fence board O Holy Night sign tutorial is new this year. I’ve been crushing on lanterns a lot this year, too, and all the ones on the deck are from yard sales. 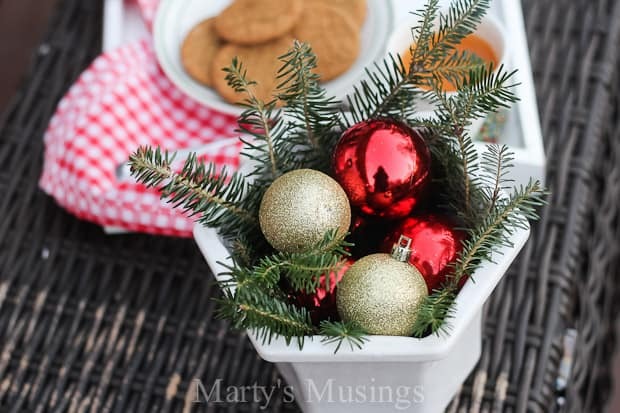 A simple $1 metal yard sale basket holds weathered inexpensive ornaments and fresh greenery. 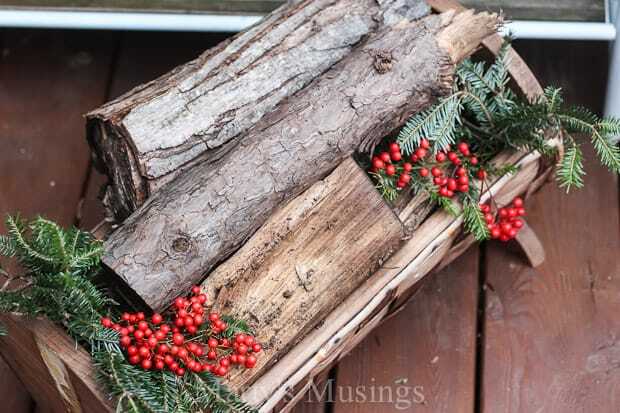 No fireplace in our home but a few old logs convey warmth and welcome guests. I hope you enjoyed visiting my home from the outside. I’ll be welcoming you inside my home later this week as well! 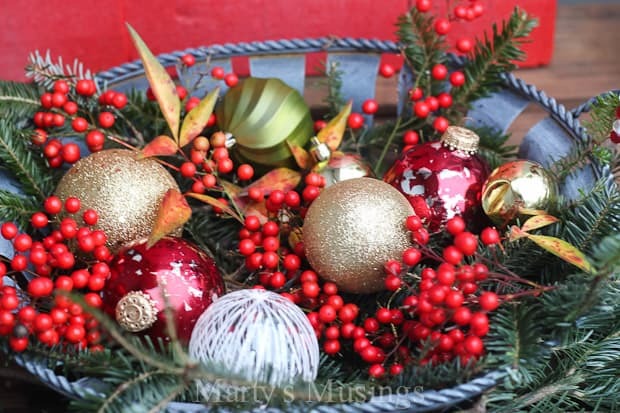 Be sure to visit as many of the links below as you can for more Christmas inspiration! I love what you have done!!! It looks very nice! I have made pillows from placemats as well! I think that was a Pinterest idea!!! They turned out really cute and I love yours! What exactly is Russian Tea?? Just curious! What is your weather like all winter long? 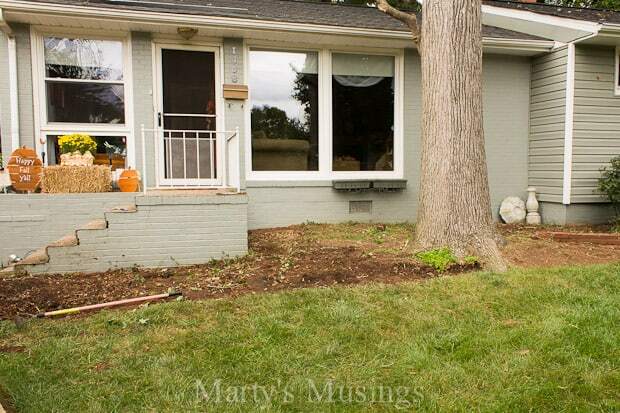 Are you going to be able to enjoy your deck through the winter? Thanks for sharing your beautiful pictures!! Hi, Lisa. Russian tea is our family favorite hot drink and a tradition for Thanksgiving. 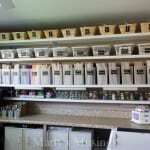 Here’s the link: https://www.martysmusings.net/2012/11/instant-russian-tea-recipe.html Our weather is mostly 30’s at night and 50’s during the day with extremes on either end. We get snow some years and others not with plenty of ice to take away the fun. Glad you enjoyed our deck! Thanks for the Russian Tea Recipe!!! Will have to try it some time! Sounds yummy! 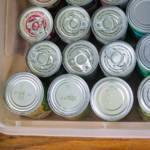 I am always open to try new recipes!!! We have had such warm weather here lately! No complaints here! 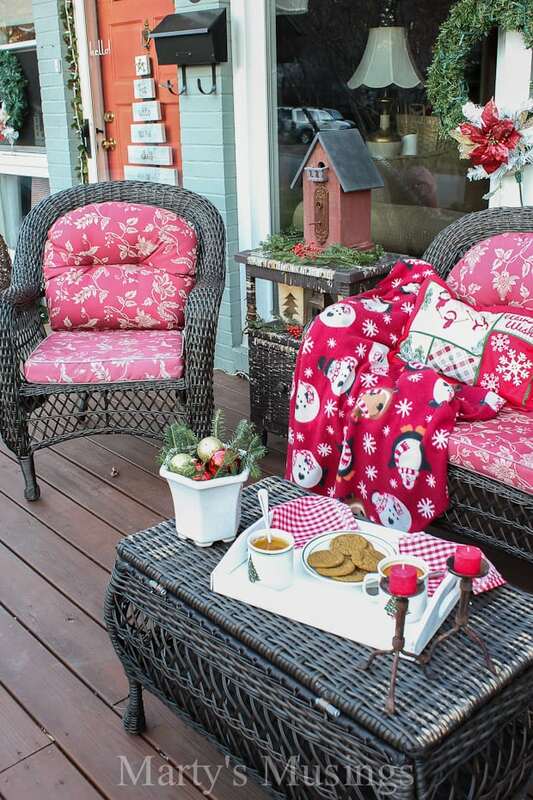 I love the way you decorated your deck for Christmas! Looks so cozy and inviting. 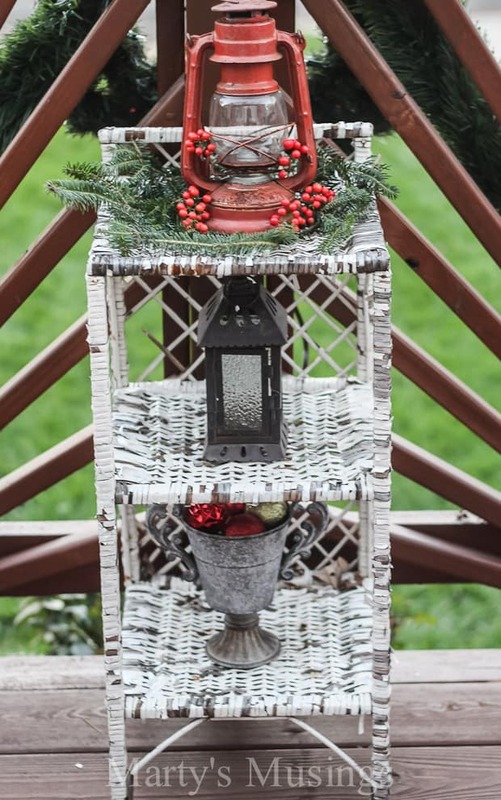 I love how your deck is styled for Christmas. It is warm and inviting. I am happy you have created such a lovely place that family and friends can dwell. Thanks, Linda! Right now our weather is much warmer than normal and I want some more cold for Christmas! 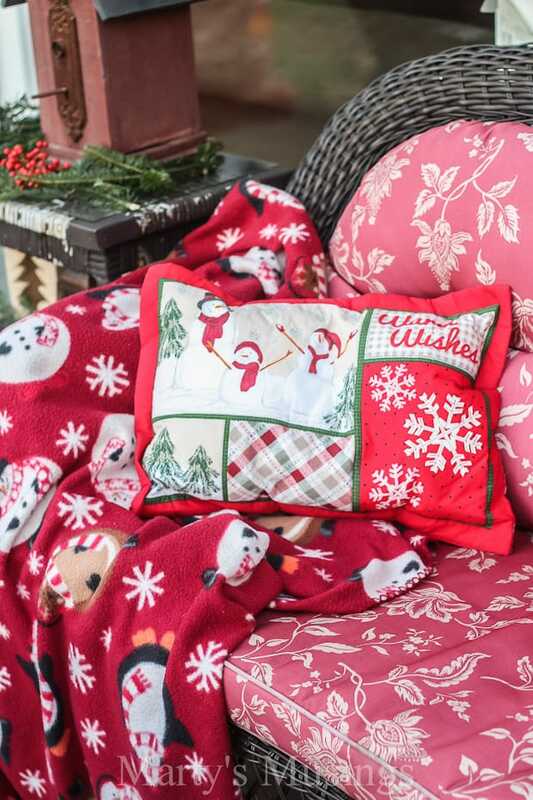 There’s nothing better than a warm blanket and relaxing on the deck. Have a wonderful Christmas! 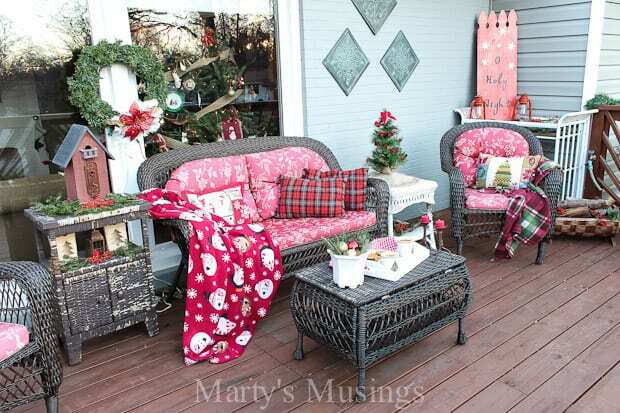 Marty love your Christmas deck! I could spend hours out there. Hi, Pamela. Thanks for visiting my deck post! Our deck is one of the best investments we’ve made in our home in both curb appeal and enjoyment factor. Hope you have a wonderful Christmas! 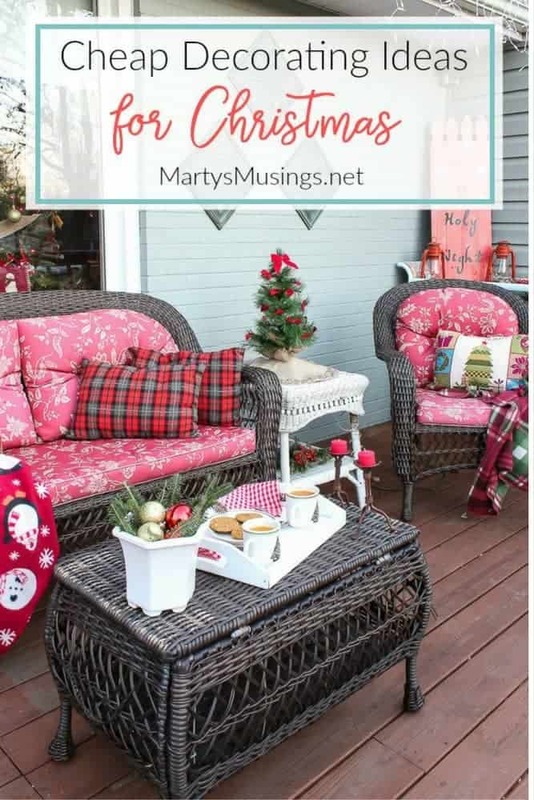 Alright Marty, I can’t even imagine having a Christmas porch so I’m going to enjoy yours! This is beautiful! I hope you get to spend many hours in that cozy area over the holidays! Beautiful! Hey, Donna! Obviously I’m late replying, but thank you so much for visiting my deck post! I know you’re enjoying your cold weather as those of us in southern states are having recording breaking WARM days! So odd. Have a wonderful Christmas with your son! Love how you bring it all together with the red! Looks great! Your deck looks wonderful and very inviting! I love how festive it looks! Have a Merry Christmas! Oh so festive and a surprise for guest visiting, “smile before entering”, it will put your guests in the festive spirit. I love the shelf with the house ornaments!! Just everything is wonderful!! 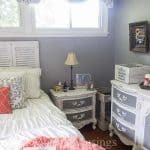 Thank you for sharing on the Oh My Heartsie Girls Wonderful Wednesday!! 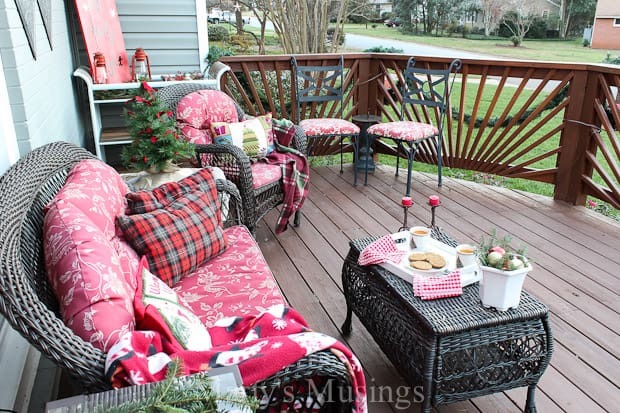 This deck is so cute and inviting for Christmas! I love the traditional use of red accents. Thanks for joining the #OMHGWW Linkup! Hi, Malisha. DIYing is addictive, isn’t it? There’s always something to be working on or improving. Thanks for the compliment and good luck with your projects!